This is a powerful 195Amp, 240V mig welder controlled by a microprocessor and capable of welding steel, galvanised steel, stainless steel or high stress steel and aluminium. 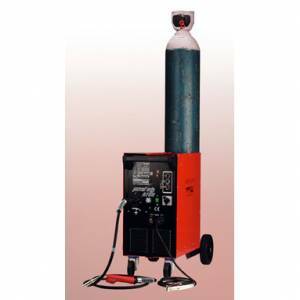 Electronic selection of gas type, metal type, wire diameter, and gas type allows this welder to cope with anything you throw at it. Mig wire spools of up to 15kg can be used and a non-live torch is connected. A forced air cooling system ensures smooth welding and an enhanced lifecycle. 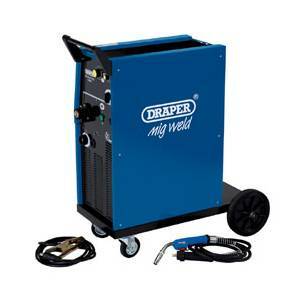 This top of the range 300amp Draper mig welder is capable of welding 10mm mild steel and other metals using 0.6 to 1.2mm mild steel wire and 0.8 to 1.2mm stainless steel or aluminium wire on spools up to 15kg. A 12 stage power setting and variable wire speed control puts you in control and there's a turbo fan cooler and full thermal overload protection to take care of the internals. Additional features include a spot weld timer, burnback and soft start. This model comes complete with a swivel joint Euro fit torch, gas bottle holder with chain restraints, wire rollers and wheel kit for portability, and an earth clamp.